If you are looking for affordable experts in the field of air conditioning systems for your home in Caldwell, NJ, You need not to look any further than your neighbors Bloomfield, Cooling, Heating & Electric, Inc., located in Little Falls, NJ. We have serviced many customers in Caldwell and neighboring towns of Wayne, Verona, Montclair and all of northern NJ. Caldwell, NJ is a very desirable place to live, located just 17 miles from Midtown Manhattan which is one of the reasons there has been a growth in new homes and old homes being renovated in the area. Whether you are building a new home or remodeling Bloomfield Cooling, Heating and Electric can provide the needed services to install an entirely new air conditioning system or repair and maintain the system you already have. We carry the traditional HVAC units and are an authorized dealer for Carrier. We also carry the popular ductless Mitsubishi air conditioning and heating systems for homes that are not conducive to all the required ducting that HVAC units generally need. Bloomfield Cooling, Heating and Electric, Inc. has been in business for over 27 years. We are family owned and operated. We service the northern, NJ area including Essex, Bergen, Passaic, and Hudson counties. When you call us you will be greeted by our professional customer service agents. They will discuss your needs and schedule a prompt appointment with a Certified Technician who has the experience to provide you with a free on-site evaluation of your home. Whether you already have an air conditioning system that needs maintenance or repairs or you are looking for a completely new unit, Bloomfield Cooling, Heating & Electric Inc., is a full service licensed and insured company. We provide a “White Glove” customer service whenever we are invited into your home. From shoe coverings to drop cloths and removal of all debris created by our service technician. We are sure you will be pleased with our services and would like to offer you an amazing $ 500.00 off a completely new air conditioning system installation. If you already have an air conditioning system, please take advantage of our special air conditioning tune up package for $ 89.99 (a regularly priced $ 149.99 service ). The tune up includes changing the filter, cleaning the coil, condensate flush line, check and tighten all electrical connections and check refrigerant charge. We always make sure that our customers are knowledge and comfortable operating the system and know what warning signs to look for. We believe that an informed customer is a more satisfied customer. We strive to accomplish superior customer service practices every time we are invited into someone’s home. 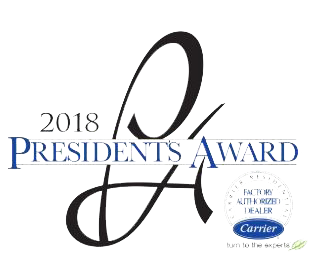 We just recently received the Carrier “President’s Award” We have been recognized by Angie’s List for the last 10 years in three categories “HVAC, Generator’s and Electrical Services”, also for the last 2 years the reader’s of Suburban Essex Magazine have awarded us the Gold Medal for best HVAC Service Contractor.